Most reviews that I write involve downloading an ISO of a Linux distribution, burning it to a USB drive or DVD and then installing it to the hard drive before even contemplating trying out the finer features of the operating system. Knoppix is one of those rare distributions designed to work straight from a USB device. There are other Linux operating systems that work in this way including Puppy Linux and SLAX. So what would you traditionally use a live USB based distro for? Well if you have done something bad to your main operating system, a live Linux distro provides a quick and easy way to boot your computer to analyse the damage. Even if your host operating system is beyond repair and riddled with viruses you can use something like Knoppix to try and rescue those all important photos that you meant to back up ages ago. Consider that old laptop that you thought was worthless. The hard drive died ages ago and it has been collecting dust in the cupboard. Get yourself a copy of Knoppix and burn it to a USB drive and you no longer need to worry about that dead hard drive. Need a computer? A bit hard up maybe. You’ve searched eBay for a new computer but they are all a bit pricey and then you see an advert like this one. is a big asset sticker which could be removed. it will be up and running in no time. machine, and the code is totally readable. The starting bid is just 99p. The chances are that because it is old and has no hard drive that the ending bid will be not much more than a tenner. Now the RAM is a little on the low side but here are the specifications for Knoppix as taken from the Knoppix home page. So now we have a few uses Knoppix (and I am really only touching the surface here) let’s give it a whirl. Now as it is a live distribution you would think there isn’t much to the installation and you would be right but there are a few things you should know. To download Knoppix visit http://www.knopper.net/knoppix-mirrors/index-en.html and choose the mirror closest to you. If you have a really poor internet connection like me then you can visit this page which has a list of online shops to order Knoppix from. You can also buy a copy of Knoppix by clicking this link. Personally as I have been having internet connection issues over the past month I obtained my copy by buying a Linux magazine with Knoppix as the cover disc. The version of Knoppix I am running is 7.2 which uses the LXDE desktop. After booting the CD you will notice that on the menu there is a Knoppix sub menu. If you click the Knoppix sub menu you will see an option called “Install Knoppix to Flash disk”. Burning to a USB device is better than a CD as it means you can then store files and install applications that persist after rebooting. When the installation is complete you can reboot and use the USB drive instead of the CD. During the startup and shutdown of Knoppix a little voice says “starting Knoppix” and “Knoppix is stopping”. Very quaint. Knoppix boots from USB very fast, lighteningly quick in fact. The performance of Knoppix in general is excellent. Now whilst performance is great there are some trade offs. The first thing I noticed was the incorrect time in the bottom right corner. Now whilst this isn’t ideal you can be comforted by the knowledge that help is at hand. I found that by visiting the Knoppix website, Knoppix Forums and the Knoppix WIKI page most of my queries were resolved. To fix the date and also the previously unmentioned language layout issue I just needed to follow the instructions on this page. The LXDE interface is very easy to use with a panel at the bottom, a series of icons in the bottom left and a series of items in the systray in the bottom right. If you click the icon in the bottom left corner then a menu will appear and by selecting a category you will see all the available applications under that menu. There is a network icon in the bottom right corner and if you click on it you should see all your wired and wireless networks. Knoppix successfully picked up my home broadband and my mobile broadband. Unfortunately I haven’t been able to connect to the mobile broadband using Knoppix. In theory it should be easy to connect to the mobile broadband device because I am using a MiFi device which just works like a normal wireless network but despite a fairly wide search I couldn’t resolve the problem. I did manage to connect to my home broadband service and therefore I was able to connect to the internet. The default browser in Knoppix is Iceweasel which is an unbranded version of Firefox. 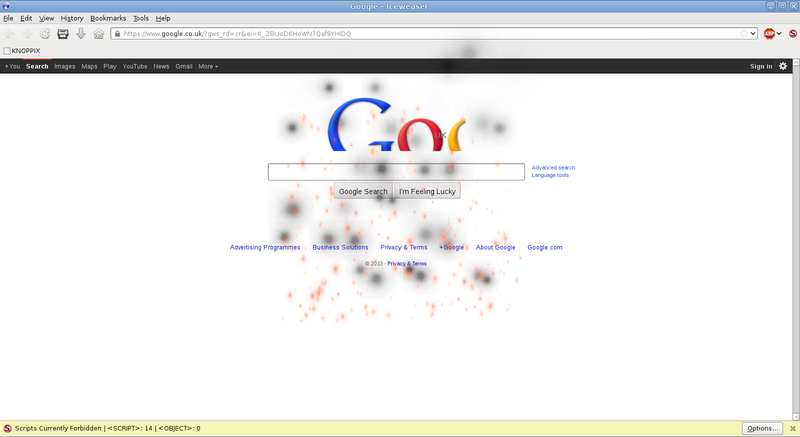 Now if you look at the screen to the left you will see that Google’s homepage didn’t render properly. The reason for that is the two add-ons that are included with Knoppix. One is an ad-blocker and the other blocks scripts from running (unless you tell the scriptblocker otherwise). Personally I don’t like ad blockers. I think that if a site is going to provide content which doesn’ t require you to pay for it then you can at least acknowledge that the site has adverts. I feel it is part of the contract of using the site. The scriptblocker for me was just intrusive. It was a lot of hassle trying to get the basic sites working properly. Flash didn’t work straight away but installing Flash is fairly easy. is an application under the Knoppix menu called “Install Components”. install non-free programs including Flash, Audacity and Openshot. As you can see from the image above the Flash installer worked perfectly and this cost me about 6 hours of my life as I then watched a number of episodes of the cult classic “Rentaghost”. As most of this article talks about “Live” distributions it is quite fitting that the Youtube video I chose for this week’s review is about ghosts. The default music player in Knoppix is MPlayer. I was pleasantly surprised to find out that Knoppix likes AC-DC straight away without messing around with GStreamer plugins. Knoppix is a live distribution and as such you can’t expect there to be too many applications installed by default (although Puppy Linux kind of defies all logic in these regards). Knoppix does come with the full LibreOffice suite including Writer, Impress, Calc and Draw for word processing, presentations, spreadsheets and art. GIMP is also included and so live distribution or not, Knoppix is a fully featured operating system. 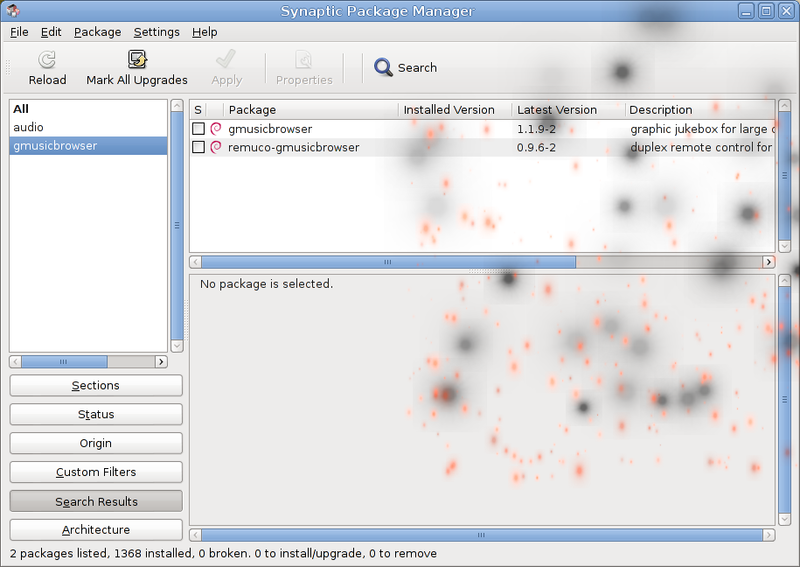 Synaptic is used to install applications in Knoppix. Knoppix is based on Debian and therefore there is an endless list of applications to choose from. I chose to install a better audio player but to keep things lightweight I chose to install gmusicbrowser. 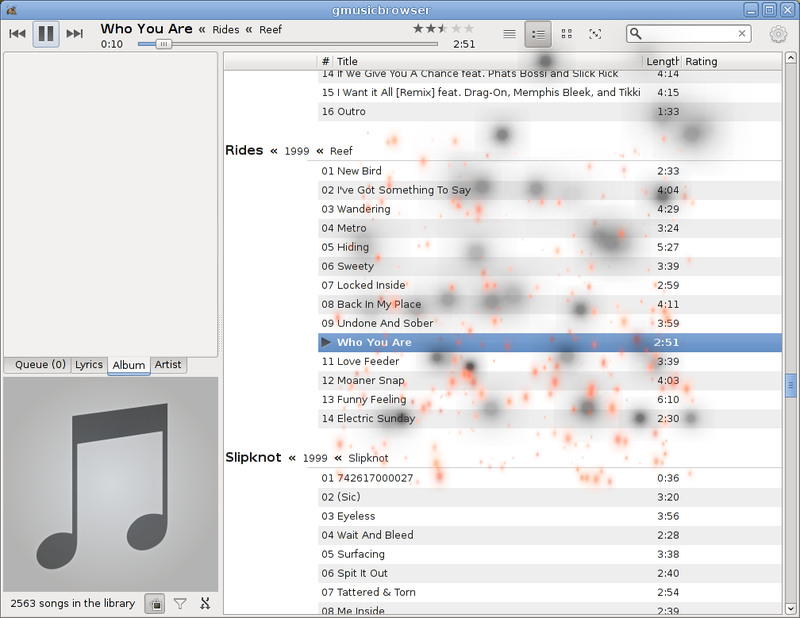 It is worth mentioning at this point that gmusicbrowser required gStreamer plugins in order to play MP3s. 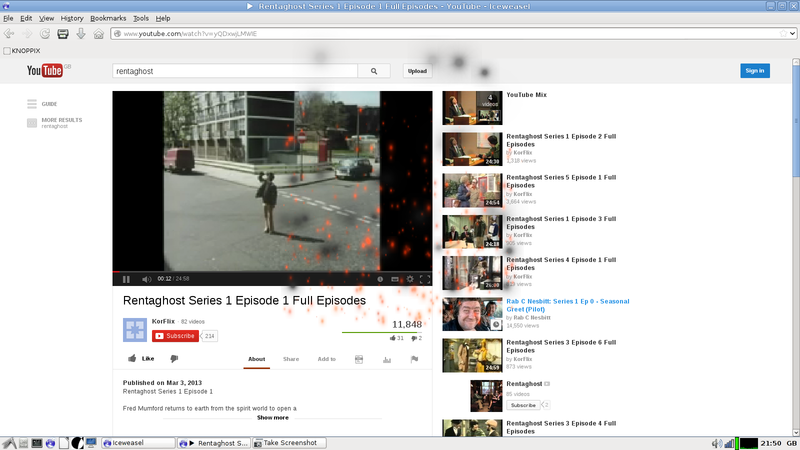 I had to install gStreamer-Ugly to get the music to play properly. 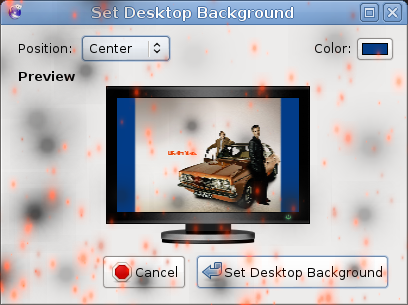 To change the desktop background select the “desktop preferences” setting from the preferences menu and then find the image you want to use as a desktop background. You may have noticed that a number of the screenshots in this article have little dots on them and you might be wondering why that is. Knoppix comes with Compiz Fusion installed by default. 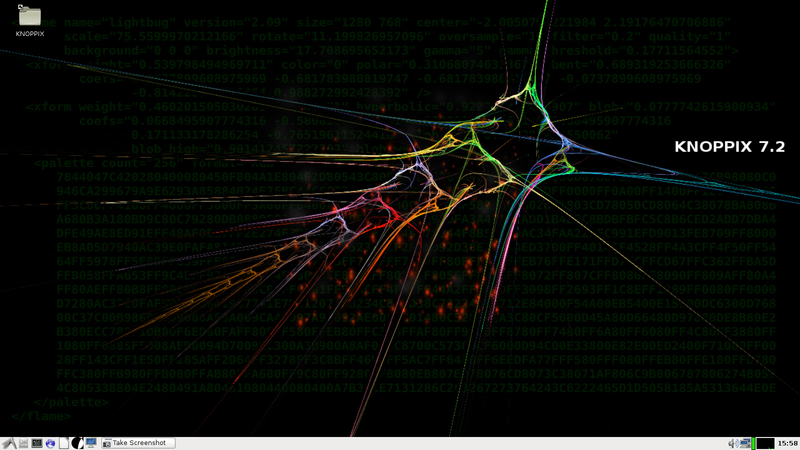 Compiz provides all sorts of desktop effects such as wobbly windows and a rotating cube. 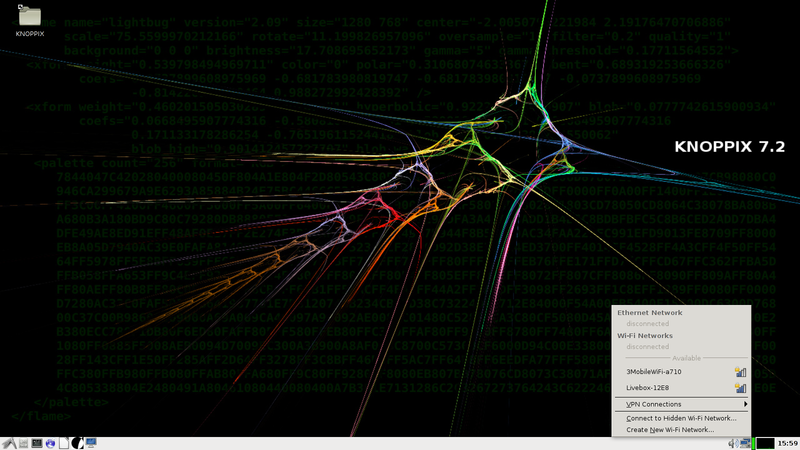 Knoppix is really good. There are a few quirks here and there but it is definitely a distribution you can get your teeth into. The fact that there is an office suite and GIMP installed means that you can use Knoppix without ever worrying about installing it to the hard drive. This might not be the distribution of choice for somebody new to Linux as there is some reading required to get all things working perfectly. I have read the WIKI page and by all accounts Knoppix is able to handle UEFI. When I tried to use Knoppix on my new UEFI enabled Dell laptop it wouldn’t boot. 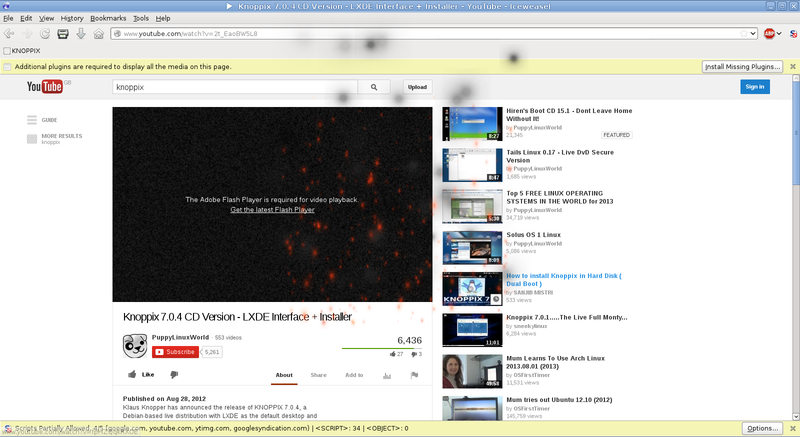 I think this is due to using the CD version which is 32-bit. All in all Knoppix is one of those handy distributions for keeping on a USB drive in the front pocket of your rucksack or on a USB drive attached to your keys. You never know when you’ll be asked to fix a friend’s computer after they clicked the image of Miley Cyrus performing a certain dance that has caused a virus to takeover and render their machine useless. Prior to releasing this review I conducted an interview with Klaus Knopper who is the founder of the Knoppix project. Click here to read that interview. Who said Linux is harder to use than Windows? Good helpful review. One thing I'm not sure about is whether all PCs will boot from a USB stick or not. Is this a BIOS setting specific to a PC? In most cases you just need to go into the bios and change the boot order. With modern laptops with UEFI incorporated you might need to change to legacy boot mode. The Knoppix home page says that Knoppix should now boot in UEFI mode but it is experimental. On my UEFI computer I had to switch to legacy mode and make sure that boot from flash drive is enabled in BIOS. 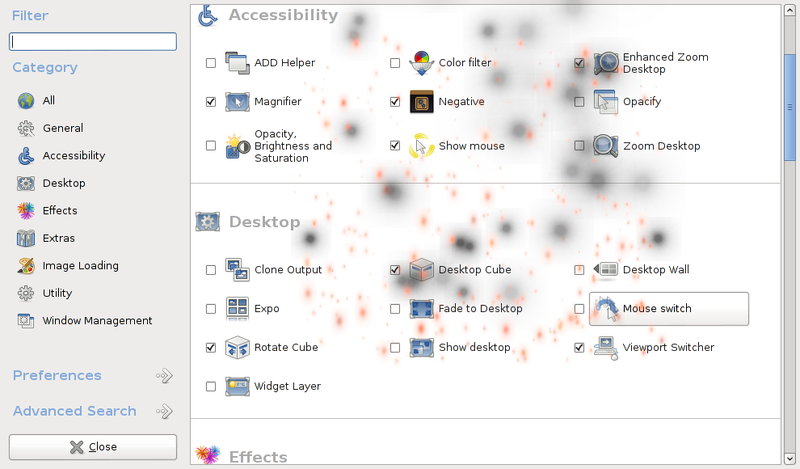 then I realized that doesn't make any sense, and it's just compiz's flame effect. very nice review, thank you! "Knoppix is one of those rare distributions designed to work straight from a USB device." Wikipedia says: "designed to be run directly from a CD / DVD (Live CD) or a USB flash drive (Live USB), one of the first of its kind for any operating system." I was under the impression that Klaus Knopper invented the live CD. Correct me if I'm wrong. Thank you! I had a terrible time trying to put this on a flash drive with UNetBootin. This worked perfectly. I haven't seen these instructions anywhere else, even after a lot of google searching. ps: i don't have UEFI so enable 'legacy' mode if you do first. I love Knoppix – also on boot you can select desktop=GNOME|KDE.. and not just be stuck with LXdesktop. Primarily use it on other people's win machines allowing me to fix issues, or use their machine without windoze. 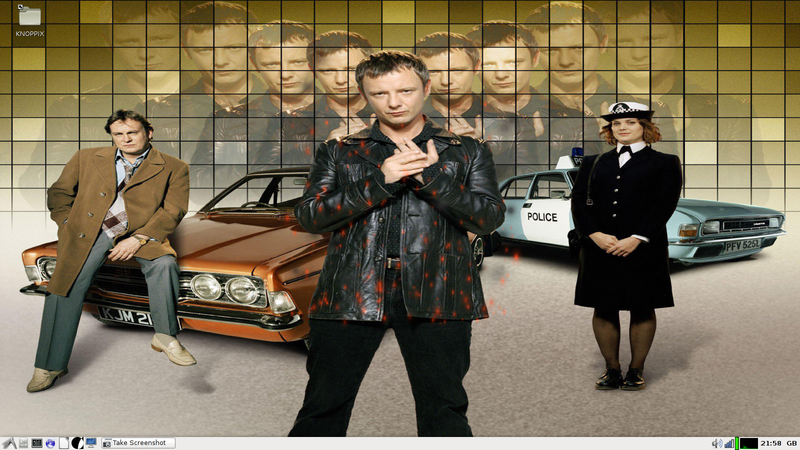 But also have it on one old desktop of my own (installed on HDD). I have a KNOPPIX 7.2 CD from a Linux magazine. I booted it from it just fine, then used the "Install KNOPPIX to flash disk" menu option to write it to a flash drive. Found the language and keyboard settings did not default to my preferred settings (US). Checked the site you pointed me to, but the /etc/init.d/knoppix-autoconfig file doesn't match what was shown there. There is a "localize()" function, but no "### localization" anywhere. Looks like that site you referred to ( http://knoppix.net/forum/showthread.php?25196-FIX-KNOPPIX-not-showing-correct-language-Timezone-fix ) might be about an earlier version (the article dates back to 2006). I am now seeing about fixing the configuration files on the flash drive, but seem to be unable to loop mount the /KNOPPIX/KNOPPIX file on the flash drive (it seems not to be an ".iso" file and mount doesn't recognize it as a valid file system). in KNOPPIX 7.2.0 it is relatively simple to change time zone and time. Click the fist bottom left corner icon, go to "Preferences" and look for "Date and Time" to adjust those settings. hey am a beginner i tried booted knoppix 7.2 from cd. found a folder at the left to of desk top called knoppix but no where i could find install to flash or usb menu. more over the mouse cursor function is not working from cd. only enter and escape and few keys i know. i want to retrieve the files from dell lattitude E6430 after windows 8.1 crashed. i tried with ubuntu 14.04 its not going to any other drive other than the flash drive. means i cannot acess any files outside that flash drive. please help me ho to proceed. Since you we're using Windows 8.1 did you make sure you turned off the secure boot. When I first tried to install a linux distro, Windows boot loader was preventing me from doing anything. I did have to turned off the secure boot and set my boot loading sequence in the bios. to ATI CD/DVD, SATA, and Windows boot loader last. You can also reformat your hard drive and remove Windows 8 from you PC itself. That is what I did. No problems now getting any Linux disrto to run on my computer. AMD 64 bit is what my machine runs. That laptop actually can run windows 7 fine… (it looks the same as my dell laptop, so I'm assuming its the same one), so you really don't need windows XP, Though I generally keep Linux on computers. Sometimes, it becomes necessary to fix some additional laptop parts, such as RAM, to enhance the efficiency of a laptop, so that it becomes easier to install the space-consuming software and tools.